Thanks for taking the first step towards bringing Talent Activation to your organization! Please enter your information and select the checkbox below to receive new episodes directly to your inbox. We all have unique strengths, and work should be one of the places we can express them and contribute them to the world. Yet only 2 out of 10 people say they use their strengths every day at work. 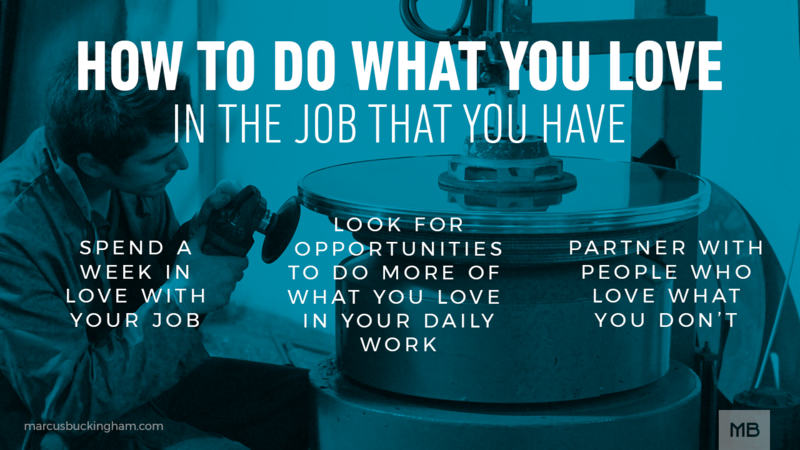 But that doesn’t mean that 8 out of 10 people should be looking for new jobs – there are ways to do what you love, in the job that you have. If you’re one of the 8 out of 10, here’s three things you can do in order to build a life where you can contribute the best of yourself in your current role. Spend a week in love with your job. For one week, keep a “Loved it/Loathed it” list, and every time you look forward to a task or find time flying by during an activity, write it down in your “Loved It” column. Likewise, if you find yourself dragging your heels before a specific task, dreading it and slogging through it, write it down in the “Loathed It” column. By the end of the week you’ll have a list of things that you love doing – these are strengthening activities for you – think of these strengths as red threads of love in your job. You can love what you do at work every day. It’s possible in the job that you have, but only if you take responsibility for owning, honoring, and contributing the best of yourself. I’ve just been recently introduced to your work and I thank you for sharing your insights, especially on strengths & weaknesses. I’m curious about your thoughts on weaknesses as they relate to growth opportunities. Finding a team member to partner with on your areas of weakness makes complete sense, but what if the weakness is an area you perceive to be an area for personal growth? For example, being brave to make a public decision that may be unpopular may trigger feelings of self-doubt and lack of confidence. Personally, I feel it would be empowering and worth the effort to lean in and dig into those core feelings so that you may transform that weakness into a strength. What are your thoughts on that approach?